A new Fairtrade exhibition has launched at Downend Library. 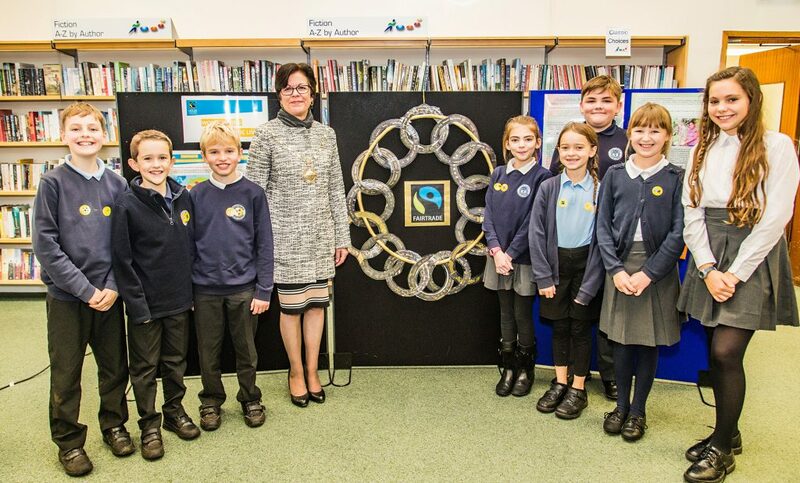 Pupils from Christchurch Junior School in Downend visited the library for the launch event, which included a large piece of Fairtrade gold themed artwork that they created as part of the exhibition’s display. The exhibition will tour South Gloucestershire libraries between now and the end of February 2017 and shows highlights of the 2016 Fairtrade visit and information about issues surrounding gold mining. As well as a chance to view the exhibition, the event also featured presentations about the Fairtrade Fortnight visitors over recent years, and information about some of the other international issues that they are aiming to highlight, including the mining of gold. The exhibition illustrates some of the problems of small scale gold mining, mercury use and how simple technology can make artisan mining much safer and acquire Fairtrade status. There were also Fairtrade products on display. Chair of South Gloucestershire Council Cllr Erica Williams spoke at the event. She said: “It was a pleasure to visit Downend Library with the local school children and view this fantastic exhibition, which includes the beautiful artwork that they worked hard to create.